A Binary Options Trading Newbie Had Me.... Humbled! A Binary Options Trading Newbie Had Me…. Humbled! When a newbie to The Binary Lab‬ says something like this… I’m humbled. 11 months ago, I’ll admit, I was nothing more than a half-blind, leading blind – on a journey to make money in ‪binary options trading‬. Back then, with 10 or 11 other folks – we were left high and dry by a pack of “Binary Gurus” who really nothing more than just marketers who knew how to hype things up. While I didn’t exactly know how to do it, but with some knowledge of reading ‪‎forex‬ charts, i believed it was possible. We COULD actually make money in ‪binary options‬ trading. Along the way, people took digs at me. I made stupid mistakes and felt stupid. I even remember the times I was calling trades but didn’t even dare to take them myself, because my account started with $200 was down to $57.50. I screwed up. Not once, but more than a few times. There were the times I messed up so bad, not just on my own account, but in making bad trading calls, leading more than a few gungho trade followers on my daily webinar sessions blow their accounts. I felt TERRIBLE. In fact, I felt like waiving the white flag. I felt like quitting. I’m sure several of those people who got burnt quit. I’m not even sure if they’ve still been watching from the sidelines. Some probably even hate me. In just one the bad times, drawn down 60% on my own account, 14 members with blown accounts… (may not be the actual numbers but an estimate) it was TOO CONVENIENT to delete the group disappear from Facebook, un-publish my videos on Youtube. Back when The Binary Lab was still 130-something, 14 members may have bowed out, BUT 116 members STILL BELIEVED IN ME, and neither was I going to have people pass remarks that I’m no different from the same pack of “phoney experts” that I loathed enough to start my own group. It’s been months since then. On a weekly basis we win 70-80+% of the time. We even had a few 100% win sessions in the last weeks. 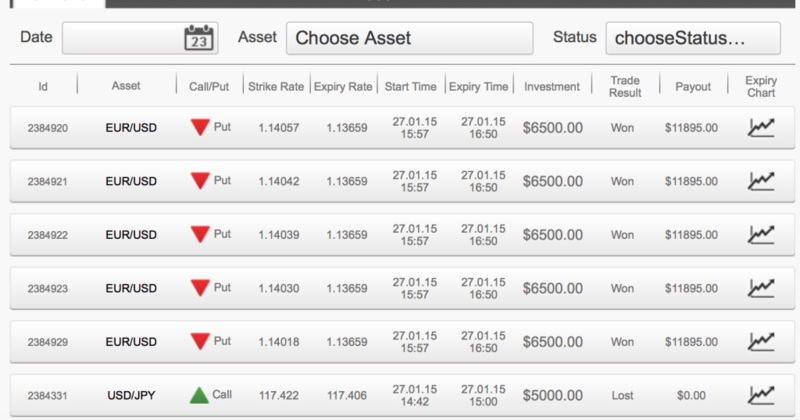 My 4th binary options account started with $10k has produced over half a million in profit. Often, the wins are bigger than the losses too. It HAS been rosy. But I still like to keep it real. I still like mentally revisiting our humble beginnings, and I still go over old trading notes – to remind myself of “tuition fees” paid to certain disasters in bad judgement, and to keep myself grounded and on track. I’m glad I didn’t give up, and I’m thankful for all the members who have stood by, and kept up the dream, and kept on trading till this very day. “With Great Power, Comes Great Responsibility”. Members of the Binary Lab, thank you for giving me that Cross, and heaving it with me. I love all of you guys. P.S. Here’s a shot of trades I took today. My trading results today’s NY Session. Tips, Disclaimer & Risk-Disclosure: When you trade Binary Options, you are basically trading Risk for Reward. Other than a good set of trading methodology, you also need to be a good master of your trading psychology. Or else, you’ll find that losing money becomes as easy, or even, easier than making it. I didn’t start out large either. Don’t feel like you have to match these trade sizes. Work within your margin and achieve steady gains. The key to long term success in Binary Options Trading is survival. Always live to trade another day. The longer you stay around, the more you will learn, and the better a trader you will become. Join 1000+ traders and start your Binary Options Success Journey by applying to join The Binary Lab here! Video Reflection On Losing 10k and MAKING IT BACK! Is it hard to make money in Binary Options Trading? I have four brokers right now but none of them is your recommended broker. Total account is more than $1,000. Do I still have to open a new account and still have to place another $1000? Hi Noreen, Thanks for your interest. According to the present rule, You must need to create a broker account under the binary lab referral to join. Currently Binary Lab free membership is subsidised by the fees we receive from brokers. I’m aware that many Binary Options “coaching programs” online require you to sign up for one or more brokers. In that, and most cases, another party has already received payment from the brokers by your signing up. If you’d like to proceed, go to the BINARY LAB APPLICATION FORM and select a broker that you’re not already part of, then withdraw the rest of your funds with brokers and put them in the account you open through us. If you have $1000 accumulated from 4 accounts, that also means that each one is only around the minimum deposit. That’s dangerous for trading! You can’t do proper money management with that. I recommend my traders to start with $1k or more. See you on our trade sessions! You may also choose to pay a fee, but that’s going to cost $797 per year. It’s better that you open an account and trade that money instead. Julian….you hit my emotions hard as you explained all about your humble beginnings. I feel so touched and I began to rearrange my philosophy about human race. Initially I was believing that people have lost their relationship with conscience related issues. I can’t imagine his many people you have given hope of survival and at the end you did it for them. You are a hero and I tell you, millions of people are looking up to you. Thanks for your sincerity and help. Good information, thanks for sharing your story. I am one step closer to making money from binary trading! I’m on the verge of giving up my job and the feeling that I drag myself everyday to work. I really want to start trading and have a time of my own. I do have a little experience in trading stocks (long term) and forex (burned account). I want to learn binary trading with your group. I WILL join the group, binary lab, but first I have one question. I know you use Goptions in your live webinar and would like to start an account with Goptions as well. Question: They need a utility bill for CC validation on withdrawal/deposit. Problem is, I don’t have any as I’m still living with my parents. Is there any alternative? I tried contacting goptions but received no response yet. Hi, Please contact their live support. If you can’t reach them, please select a regulated broker where you will get help fast. i know you must be very busy but i would like ask some assistance with regards to me joining binary lab. i would like to know how it would work for someone like me who is currently in south africa and where do i start. i see that my country is not on the list. i humbly ask if you would be able to assist.